This year’s MenuMasters award winners honor innovation in buttermilk pancakes, vegan burgers, Chinese food, snail ravioli and more. “Limited-service, family and casual-dining restaurants are all represented among this year’s MenuMasters winners, along with university foodservice, multi-concept operations and fine dining, showing how innovative the industry is across the board,” said Laura Viscusi, vice president and market leader for the Penton Food and Restaurant Group, which includes NRN. “Improvements that seem small can take a lot of work and make a big difference,” said Bret Thorn, NRN senior food and beverage editor. “That’s what we saw with Denny’s developing a new pancake, and with Panera Bread transforming its supply chain to remove artificial ingredients. This 120-unit better burger chain based in New York City entered the fried chicken sandwich segment with this antibiotic-free, buttermilk-batter-fried chicken breast with lettuce, pickles and buttermilk herb mayonnaise. The 215-unit casual-dining chain, based in Scottsdale, Ariz., responded to consumer demand and turned to local management for this offering. Each local menu featured a custom lineup based on the most frequently requested dishes at that location. Management chose three dishes from among the following: Dali Chicken, Pepper Braised Beef, Chengdu Spiced Lamb, Black Bean Chicken, Lemon Pepper Shrimp and Flaming Pork Wontons. Pancakes are on 35 percent of all the plates sold by this 1,733-unit family-dining chain, based in Spartanburg, S.C., which introduced a fluffier version of the hallmark menu item, which helped boost sales and made Denny’s the largest user of fresh buttermilk in the country. Students on campus in Provo, Utah, have taken to this version of the Hawaiian plate lunch — a sort of bento box of two scoops of rice, one scoop of macaroni salad and choice of protein — that director of dining Dean Wright first saw at BYU’s Hawaiian campus. It has proven to be so popular that it is outselling some national brands at the campus food court, racking up $900,000 in sales since opening last year. Panera Bread started working to remove artificial flavors, preservatives, sweeteners and colors from all of its items since 2014. Last year, it completed the process, partnering with more than 300 food vendors to change 122 ingredients. Chloe Coscarelli and Samantha Wasser have grown this vegan concept to seven units, in New York City, Los Angeles and Boston, since July 2015, showing that a 100-percent meat-free restaurant can flourish, as long as the food is delicious. The chef and owner of Girl & The Goat, Little Goat and Duck Duck Goat, all in Chicago, hit the national stage as winner of Bravo TV’s “Top Chef” in 2008, and went on to be named one of Food & Wine magazine’s best new chefs in 2011. 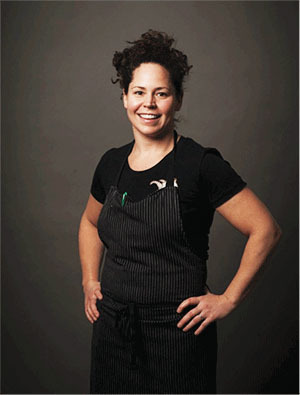 The James Beard Foundation named her the best chef in the Great Lakes region in 2013. But her innovation comes from her creative and approachable food that includes roasted beets with white anchovy and avocado crème fraîche, escargot ravioli with bacon tamarind sauce and wood-fired shrimp with vadouvan spice, pomelo, pine nuts and pumpkin seeds. A pioneer in the Southwestern cuisine movement in the 1980s, Stephan Pyles has remained a fixture on the Dallas dining scene ever since, including Flora Street Café, his latest restaurant, which opened in the Dallas Arts District last spring. A fifth generation Texan, he has created 22 restaurants in five cities, has written four cookbooks and was hot for two seasons of the Emmy-award winning PBS series New Tastes From Texas. All of the winners will be fêted at MenuMasters’ invite-only, 20th anniversary celebration at the Drake Hotel in Chicago, on May 20. An earlier version of this story misstated the number of Denny’s locations, which is 1,733.